Check out our online catalog! It's easy to use. Simply click on the library catalog button in the right upper corner of your screen. You will be redirected to our catalog. To log into your library account, enter your library card number (ask the librarian if you have forgotten) and enter the initial password USERPASS. You will then be prompted to change the password to a personal password. Please contact library staff if you have any questions. Book Club meets November 13th at 10 AM at the library. We are reading The Testament by John Grisham. Copies are available at the Circulation Desk. All are welcome! Will resume in January. Bring your mini kit! Everyone is welcome! Contact Merrie Knapp at 767-3516 for more information. Do you have a child age 0 to 5? Register your child for Dolly Parton's Imagination Library! Children age 0 to 5 who live in Tekonsha School District are eligible for FREE books every month at no cost to the parents. Call the library with any questions! 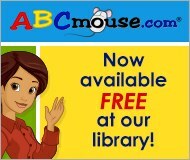 - Download EBooks and Audio Books to your home computer 24/7!